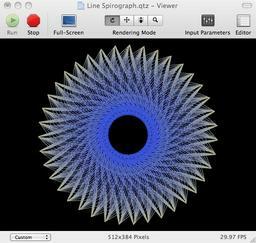 This is a intermediate level composition that shows how to construct a Spirograph style shape by using GL Lines (GL Tools patch required), Iteration, Interpolation, and LFO's. By using GL Lines, one has control over many interesting Stipple Patterns, and color control. This patch also has controls for Spirograph movement duration, max and minimum points for Spirograph extent, and controls to affect the way the movement of the Spirograph. This patch will not work well in a Lighting environment due to the nature of GL Line. ooo i like the spirograph. Thanks. There's even more manipulation available by digging in there and tweaking some of the unpublished parameters. Animate a couple of inputs and there's a music video right there (animated wallpaper!). Nice work, george. I like simple concepts made in an interesting and innovative way — just like this, cool. That's fantastic. Nice use of the CubicCurve plugin. Really interesting. Way better than a spline, performance wise. Check this one... Reminds me of that floating thing in Avatar (albeit, without trying to tweak it in or referencing actual footage, and a red/yellow color palette).